For many, the holiday season wouldn’t be complete without colorful lights and beautiful decorations around their homes and yards. In fact, a 2013 survey from the Electrical Safety Foundation International found that 86 percent of Americans celebrate by decorating their homes for the winter holidays. 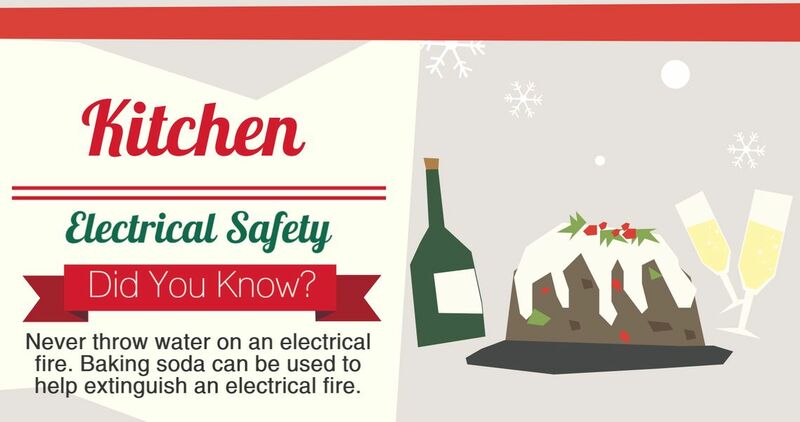 While electrical decorations add to the fun, they can also increase the risk of fires or injuries if they’re not used properly. Follow these tips to help ensure a safe and fun holiday season! Be sure to test all smoke alarms in your home to ensure that they’re all working properly. 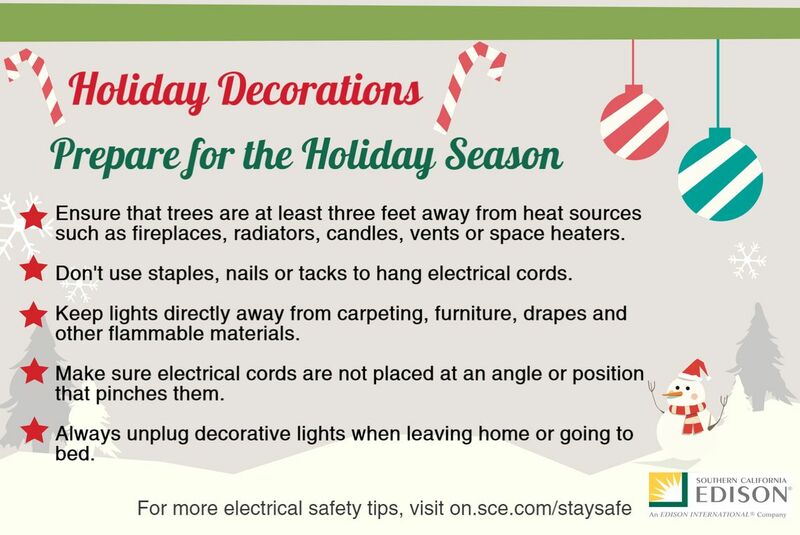 Remember to inspect decorations that have been in storage and dispose of any that have cracked or frayed wiring since these can cause electrical shocks, burns or fires. Take a look around the areas you’re planning to decorate and determine how many outlets are available so that you can plan accordingly. Read instructions that come with your electrical decorations to be sure you’re using them appropriately (i.e. 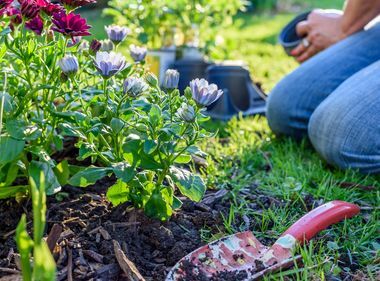 indoor vs. outdoor use). Another tip from ESFI is to buy electrical equipment with a label indicating it has gone through independent testing by a nationally recognized testing laboratory, such as Underwriters Laboratories (UL). 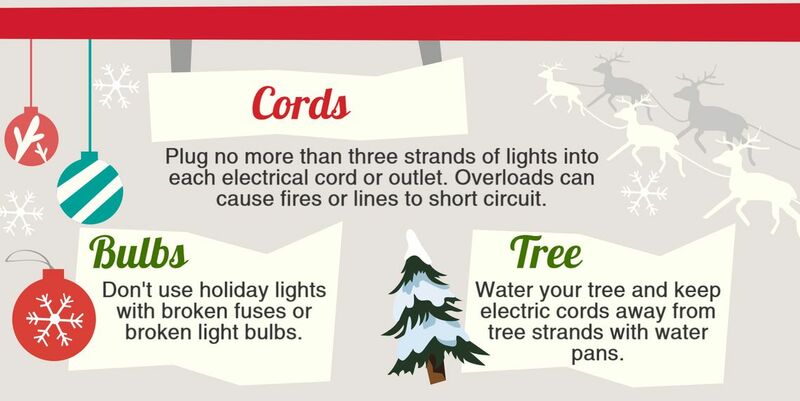 Remember not to overload and overuse your extension cords. Before climbing your ladder to put up your holiday lights, inspect it for loose or missing screws. Thousands of people are injured each year due to falls related to holiday decorations. 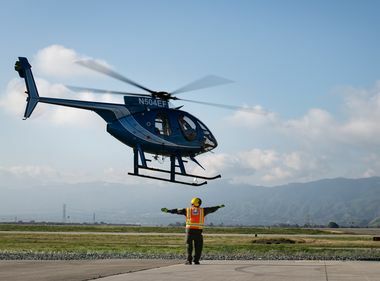 Decorators should always look up and look out for power lines and never install lights and cords within 10 feet of the wires on utility poles. Be sure that decorations meant for outdoor use are appropriately labeled for outdoor use only. When hanging lights outdoors, use a wooden or fiberglass ladder. Be sure your ladder is stable and secure before putting up your holiday lights. Outdoor electrical decorations should be plugged into Ground Fault Circuit Interrupter-protected outlets. 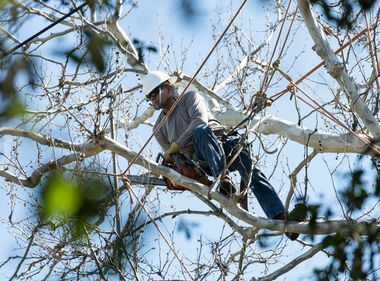 For live trees, be sure to fill your tree stand with water and refill daily since heated rooms can quickly dry them out. Don’t use electrical ornaments or light strings on artificial trees that have metallic leaves or branch coverings. To help avoid fires, remember to place your tree at least 3 feet away from all heat sources, such as fireplaces or space heaters. According to ESFI, 45 percent of home decoration fires are sparked by candles, with December being the peak time of year for candle fires. 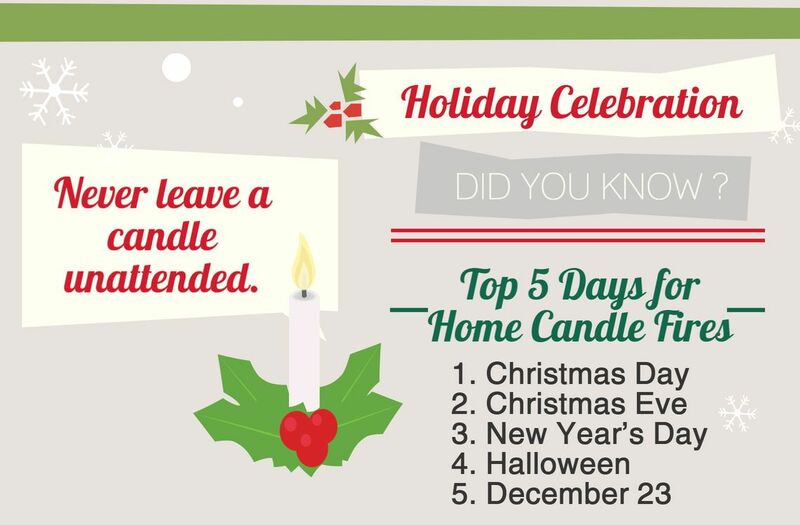 The top three days for candle fires are Christmas, Christmas Eve, and New Year’s Day. About 5,800 people hospitalized each year for falls associated with holiday decorations. 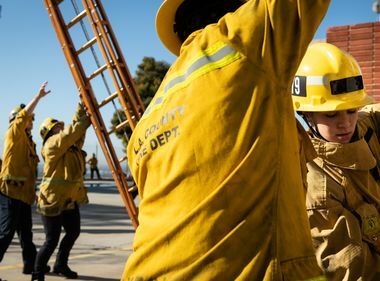 On average, 260 home fires begin with Christmas trees each year, resulting in about a dozen deaths and 24 injuries.